Factair has an extensive range of breathing-air compressors, long duration cylinder sets and confined space ventilation fans designed for ATEX Zone 1 and Zone II environments. 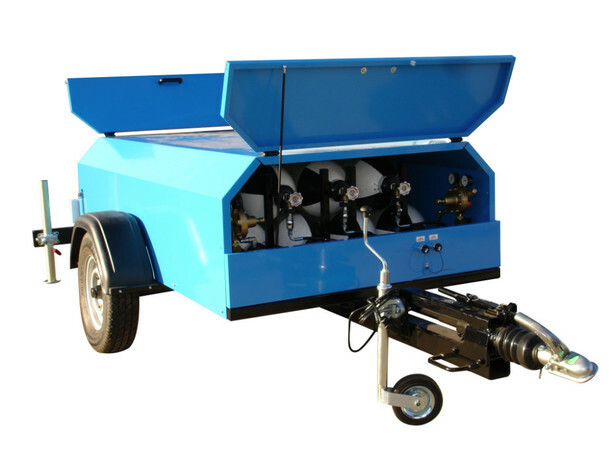 The BA20EX and BA22EX are 2 outlet Zone 1 mobile electric breathing-air compressors capable of operating from either a 50 or 60Hz supply. 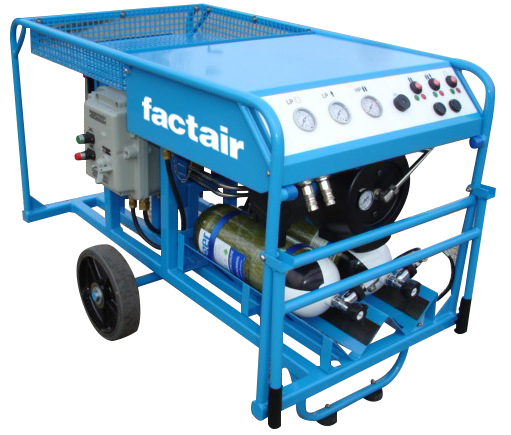 Alternatively for sites where a power source is not available, Factair can provide its TrailAir range of long duration breathing-air cylinder systems. These units are available in a number of road towable configurations with optional storage lockers and hosereels. Where confined space ventilation is required Factair has both compressed-air powered and electric driven solutions in the form of the AF300P and AF300EX ATEX Zone 1 fans. These can be provided with matching ant-static wire reinforced ducting. Manufactured at Factair's facilities in Ipswich all ATEX products are registered with Lloyds and the process is routinely audited as part of the company's ISO9001 accredited QA procedures.